So you’ve got some cool toys and you want to tow them, strap them or stuff them in your car and go have some fun. Good for you! But have you ever stopped to think how your transmission feels about your boat or camper? Automatic and manual transmissions are quite different, kind of like men and women. For instance, automatic cars don’t have a clutch pedal or a stick shift but manual transmission cars do. Women are missing a few parts that men have too. But these transmissions, like men and women, are designed differently because they work differently. 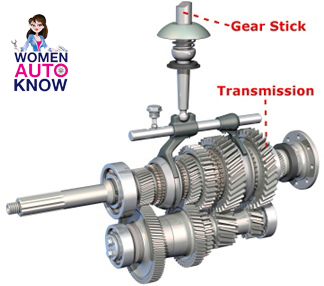 When an automatic transmission is put into drive, the gears shift automatically. A manual (MANual – get it?) transmission, with it’s stick and pedal, shifts gears with manual assistance. If cars didn’t have transmissions, they would only drive in one gear. That means if you wanted to go really slow, or really fast, you would be stuck in 3rd no matter what. For anyone who has ever driven a stick shift, you know that 3rd gear is great for cruising lazy country roads, but not so great for highway driving or stop and go traffic. The transmission’s gears use the torque from the engine to keep the engine operating at an appropriate and effective speed. This means when you are towing your toys, the transmission will shift to a lower gear to keep it from working too hard and overheating. In fact, many vehicles that are designed to tow come with transmission coolers (not the kind filled with beers, water and yummy snacks) to prevent this overheating. Manual and automatic transmissions – like men and women, switch gears differently. Wow, ain’t that the truth?! Back to cars ladies… Manual transmissions lock and unlock different sets of gears to the output shaft to achieve various gear ratios. While in automatic transmissions, the same set of gears produces all sorts of different gear ratios. The clutch is required on manual transmissions to disconnect the wheels from the engine. Because engines spin continuously, if you ever want to stop, the car’s wheels must be disengaged from the engine. The clutch smoothly disengages a spinning engine to a non-spinning transmission by controlling the slippage between them. The emergency brake (aka – parking brake) is a necessity for cars with clutches. Because the wheels stop spinning when you press the clutch, they will roll forward – OR BACKWARD – between gears depending on whether you are on a hill or not. So…. if you find yourself climbing a steep hill, stuck in traffic on a mountain, or just parked at an incline (think San Francisco and waiting for a parking spot), either keep your foot on the brake pedal, or keep it in neutral and pull that parking brake! Remember: Manual and automatic transmissions have different parts (sticks, shafts, clutches) and different methods (switching gears manually or automatically) that help get you and all of your “gear” to your destination. This entry was posted in Auto Safety and Prevention, How Cars Work and tagged gears by Women Auto Know. Bookmark the permalink.